Want to be an OnFarm Pro? 5 Tips on how to get there quicker! Only want to display data within a certain range? 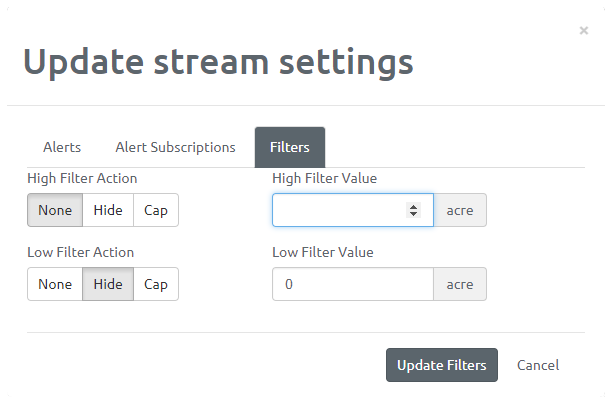 Through OnFarm’s filtering tool, you can set high and low filter caps to clean up your data. Perhaps, you’re not concerned with very low values, you can just set a low cap or just a high cap. In the example below, we’ve set both a low and high filter cap. As you can see, the graph on the right only shows a range of 0.27 to 0.29. You’ll want to note that any values that fall outside the range will appear at the capped values to ensure a better data display. You can also hide data. Maybe you’re not at all interested in values zero and below and having these values throws off your data display. Through OnFarm, you can hide these specific values. If you set a low value, say of zero, with no high value, the chart will not display any values zero and below. If you just set a high value, data above the high value will be hidden, not including the actual high value. If you set both, you can hide all values at and below the low value and above the high value. This will give you a more complete picture of your data without these unnecessary data points. Make sure you never miss out on important data thresholds! You can set-up and enable alerts for your data. Once you’ve set-up alerts, you can create alert subscriptions. These subscriptions allow you to receive text, voice and/or email alerts. You’ll be notified even when you’re not logged into the OnFarm app. Do you have multiple users in OnFarm? Fully set-up one user and we can clone all the dashboards (including widgets within each dashboard) to all your other users’ accounts. At OnFarm we want to ensure you and your team are getting the most out of your OnFarm experience. Our dashboard cloning reduces set-up time and ensures all users have the same view. When cloned, this is a snap shot in time so each user can then update his/her account to their specifications. You can clone some or all dashboards giving each user a view most relevant to their duties. Do you constantly switch between screens? At home, you’re on a desktop or laptop, then you go out in the field and use something more portable such as a tablet or phone. When you change screens, your widgets will readjust positions to fit the screen size being used. We offer a lock dashboard option. You can set-up your widgets in the positions of your choosing, then click the lock icon. This ensures that no matter what your screen size, you’ll maintain your widget organization.